'Twas the Night Before Christmas – Jillian Harker, Clement C. Moore, Hans Christian Andersen, et al. Author: Jillian Harker, Clement C. Moore, Hans Christian Andersen, et al. 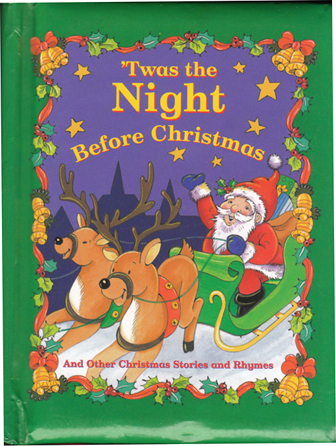 Description: "A collection of stories, rhymes and carols to share. Young children will enjoy this collection that perfectly captures the mood of Christmas." Delightful, bold, full-page colour illustrations throughout. Padded pictorial boards are bumped in places, but in very good overall condition. Internally the book is as new. Features a 'ribbon' bookmark. Measures 17 cm × 13.5 cm (6.8″ × 5.4″). 12mo. 47 pp.